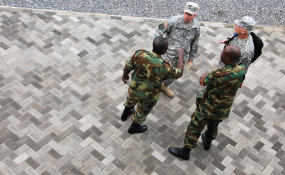 U.S. and Ghanaian soldiers discuss logistics for procuring and transporting medical equipment during a U.S. capacity building initiative . A stepped-up role for the American military, which has been the subject of widespread discussion and debate since the establishment of the U.S. Africa Command (Africom) in 2008, has been getting more U.S. press attention in recent weeks. "The U.S. military is expanding its secret intelligence operations across Africa," the Washington Post's Craig Whitlock reported last month in the first of a series of ground-breaking articles. Whitlock described "a network of small air bases to spy on terrorist hideouts from the fringes of the Sahara to jungle terrain along the equator, according to documents and people involved in the project." Some State Department officials have "reservations about the militarisation of U.S. foreign policy on the continent," Craig reported, fearing the "potential for creating a popular backlash." "Keep your eye on Africa" journalist Nick Turse writes in an investigative examination called America's Shadow Wars in Africa posted this week on the blog TomDispatch.com and cross-posted on Huffington Post. "The U.S. military is going to make news there for years to come." A 43-page report last year by the Congressional Research Service concluded that Africom's rising profile and large budget could lead Congress to "exert its oversight authority to monitor the command's operations to ensure that they support, rather than guide, U.S. political, economic, and social objectives for the continent." The Africom commander, Gen. Carter F. Ham, describes the command's reach in much more modest terms. The United States is not planning "a large, permanent military presence in the continent of Africa," he said in a lengthy presentation on June 26 to a two-week seminar for senior African security-sector experts. Instead, he said, there is and will continue to be a "small, temporary presence of U.S. military personnel" in various parts of Africa, as needed to meet contingencies. There is a perception that the U.S. military is playing an increasingly larger role in Africa. Is that the case? There has been a small but steady and fairly consistent increase in the U.S. military's engagement in Africa since the command was formalized on the first of October 2008. It's taken time to organize things, put in place the infrastructure and personnel. But also with the withdrawal from Iraq - and now the beginning of the end in Afghanistan - there are more people and resources available and we have a better sense of how we want to employ those resources in Africa to pursue U.S. security interests through strengthening African capacity to provide for their own security over time. Is the principal mission to combat terrorism? There is virtually no direct fighting of terrorists. Due to the unfortunate realities in Africa, there is concerted effort to work with African militaries and governments to enable them to confront terrorists and terrorism and to allow us to protect U.S. national security interest through expanding the capacity of African militaries to deal with their own terrorism problems directly themselves. By and large our approach is what we call 'by, with and through' - developing partnerships for extended periods of time to develop the capacity in African militaries to deal with the problems themselves, so we don't have to do it. Fundamentally, the underlying credo of the Africa command is that it's in our direct national security interests to develop the capacity for Africans to provide for their own security on a sustainable basis. And that's done through a combination of approaches? Well, it's done through what we call 'sustained engagement,' and this is a very long-term undertaking. There really are no short cuts. It requires political will. It requires resources, and, first and foremost, it requires time. This can't be done overnight. Essentially what we are doing is building institutions at the national level, at the sub-regional level and at the continental level. So we work with the African Union, we work with the regional economic commissions to develop their peace and security architecture and to promote the cooperation of African countries among themselves. There are virtually no security issues in Africa that are conducive to solutions by one country alone. They almost always require regional approaches. Terrorism is not limited to one country; terrorists move around. The underlying problems that generate terrorism are problems that extend beyond any border, and we try to foster communication and interdependency and joint approaches by African countries themselves. One example would be the efforts aimed at Uganda's rebel movement, the Lord's Resistance Army, and its leader Joseph Kony? That's an example. A better example would the African Union Mission in Somalia (Amisom), involving Uganda, Burundi and now Djibouti and Kenya and Sierra Leone - underwritten by the United States and the United Kingdom and the European Union under a UN Security Council mandate. It's truly an international effort, but the African nations - particularly those five - are bearing the brunt of the burden and paying a pretty steep price for doing that as well. This is not 'peacekeeping without cost'. Burundi and Uganda have lost hundreds of peacekeepers in this effort. That shows that they take it very seriously -- and it's hardly known in the United States. What is the Africom role in Amison? Africom forms part of a broader U.S. government effort to train and equip these nations to go into Somalia and survive, to defend the transitional government, which we hope will become a federal government - without the "transitional" moniker later this summer - so that they can work to develop the government institutions necessary to run a modern society that has the confidence of its people, that is legitimate, that is democratically elected, and can go about the long term effort to provide for the better standard of living, a better life for the Somali people. What about Africom in Northwest Africa? That's a problem area that has gotten significantly worse during my three years at Africom. Three years ago, the problem was largely limited to several hundred Al Qaeda in the Islamic Maghreb (AQIM) terrorists in isolated in the north of Mali. Then they happened upon a fairly effective business model of kidnap-for-ransom and so became very well financed. They have used that finance to sink their roots into indigenous societies in the Sahel. More recently, two events have made this a far more dangerous problem than it had been previously. The first is AQIM and its very concerted efforts to influence Boko Haram, an organic indigenous Islamic organization in northern Nigeria that has adopted many of AQIM's tactics - bombings and attacks on civilians - to make them a very serious and dangerous threat to the Nigerian government. Second is the fallout from the fall of Qaddafi in Libya and the return to northern Mali, in particular, of many Tuareg who had been employed in the Libyan military and by the Libyan government. They have returned to northern Mali extremely well-armed over the course of the past year. This has contributed to a revival of historical grievances against the government of Mali and led to a splitting up of the country, which precipitated a coup by the Mali military in the capital Bamako. You now have a fractured country and a situation in the North in which Al Qaeda in the Islamic Maghreb is able to operate very freely and openly. This gives the group a chance to seriously recruit and grow, to sink deeper roots and to operate more freely. It's more dangerous to us but also to the Africans themselves. Is there a risk that increased U.S. military presence in Africa could worsen rather than improve the security situation? Al Shabaab in Somalia and AQIM in northern Mali have been plotting against the United States, against Americans and more broadly against Western interests. That's not new. And the situation in those countries is dangerous not only to American but also Western interests. At the same time, we have interests identical to those of the nations of the region. We are in Africa to protect American interests. That is why the American taxpayer pays for the U.S. Africa Command. After considerable analysis and study, we have concluded that the best way for us to protect American security interests in Africa is to assist the Africans in developing the capacity to provide for their own security.